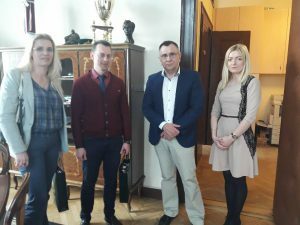 On March 26, 2019, Director of the Center for Ukrainian and European Scientific Cooperation Dmytro Bielov and representatives of the Center Sibilla Buletsa, Myroslava Hromovchuk visited Debrecen where met Executive Board of the University of Debrecen within the context of working visit. Vice Rector Ákos Pintér was on behalf of the Administration of Debrecen education institution. The University of Debrecen (Debreceni Egyetem) is the largest educational establishment in Debrecen and one of the leading research universities in Hungary. 1538 is considered to be the foundation year when the Calvinist College was opened in Debrecen. The institution has been transformed and reorganized several times. The first university institution was formed in 1912 (Royal University of Debrecen) based on the Debrecen high schools. To date, Debreceni Egyetem occupies a leading position in the Hungarian higher education system. At the international level, it has considerable potential in research activities and is promoted as the intellectual center with the widest training vertical in Hungary. Dmytro Bielov, Director of the Center for Ukrainian and European Scientific Cooperation, looking forward to creating a platform for conferences, internships and cooperation in the sphere of the educational and scientific process by virtue of joint efforts and fruitful cooperation.